The Scriptures are clear that children are a blessing from the Lord to be cherished and loved, and his happens best in the context of a marriage and family that operates according to God’s design. But the reality in our culture is that many homes have been torn apart by the sin that leads to divorce and abandonment, and children often bear the scars of such brokenness. Too many children in too many homes have experienced the hurt of a parent leaving, and for this we should mourn. But we should rejoice for the gift of this new book by Jonathan Edwards, in which he shares both the pain of being left and the grace that comes through the gospel of Jesus Christ. 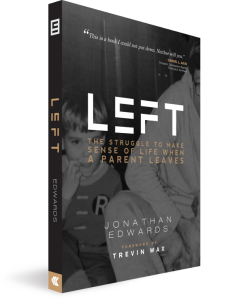 LEFT: The Struggle to Make Sense of Life When a Parent Leaves is a heart-wrenching yet hope-giving book that everyone should read, since all of us either have been scarred by parental abandonment or know someone who has. Below is the endorsement I wrote for the book. I encourage you to pick it up soon. You can purchase in either hard copy or kindle format.